Currency: Crowns Bits and Tangs. Life and Society: The Kingdom of Castros can be traced back to King Verzies Telman some six hundred years ago. Over the last three hundred years Castros has grown rapidly to encompass the southeast corner of Tharstelding. While it is commonly known that Castros is not the most militant kingdom of Tharstelding, its high level of technologic power is quickly drawing the attention of its neighbors. The people of Castros have not yet adopted that big nation feeling, and for the most part a man works when the suns come up to when they go down with little regard to the taxes and laws of the lords. Festivals, carnivals and martial tournaments are common place in the kingdom throughout the year. Major Geographic Features: Castros has most major geographical features accounted for. It has two impressive mountain ranges to its east and west, two large swamps, forests and rivers. The most noteworthy of its features are listed below. The Spine: The Spine makes up the Eastern Backbone of Tharstelding. This young mountain range is comprised of several hundred massive jutting peaks, primarily consisting of granite and frozen earth. Recent reports from Ironhold and the Sunder Coast Shires speak of large plumes of smoke snaking up from deep within the range. No known active volcanoes are recorded within the Spine, nor can anyone remember a mountain ever erupting within the range.The Spine is famous for its gigantic stone quarries and coal mines. It is also well known for the ruined dwarfhold of Aaeriock Bor and the rumored dragon hordes that always work their way into conversations about the mountains. The latest stories being carried into watering holes speak of great armies of giant men clashing in the mountain passes with titanic wingless serpents. The church of Rafar, the Bedlam Road, is headquartered within the Spine just north of the Castran Bay. It’s massive network of underground tunnels and towers span several mountains, and the great lair of Darastrixmaekrix hides somewhere in its depths. Blackfoot March: The Blackfoot March, or Blackfoot, as the locals often call it is home to a long forgotten castle with a hundred names near the center of the blighted marsh. No one remembers the actual name of the keep or when it was built. Records from the first Telman crown in 1710 CM reference the castle as a ruin as well, placing its date of destruction at least 600 years ago. The Blackfoot is mostly stagnant with swarms of creepy crawly bugs, lizards and far worse creatures. Constant fog covers the swamp during the day and night. And quicksand has been reported by those that have escaped its grip. The name Blackfoot March comes from a terrible disease that can be contracted in the swamp, in its late stages it turns the subject's feet black as pitch, requiring amputation before infection can spread through the legs. Heman Dal Mountains: The Heman Dal Mountains were once the home of Wyrm Tyrants, these ancient and powerful dragons ruled the lands east of the mountains for over two thousand years until their reign was severed by the first king of Castros, Verzies Telman. The Heman Dal is accepted as Castro's western border with neighboring Xar Zanth. This enormous mountain range is widely referenced by scholars as Tharstelding’s continental divide. The Heman Dal is the largest and highest mountain range within Tharstelding, created by two tectonic plates that formed the continent as they drifted into each other in eons past. The spires of its mountains remain snow shrouded year round, with its highest peaks said to have never been walked on by man. The majority of the range is impassible by foot any other way than via the Western Cross or the Underroads (See Below). The Heman Dals are known to house many volcanic mountains. With the last major eruption taking place nearly 400 years ago, scholars from New Catlathon estimate a large eruption is quite due. The eastern half of the mountains are completely controlled by Castros, these slopes are rich in silver, other precious metals and gems including rare Ice Iron. Beneath the mountain’s surface, dwarven Underroads connect the thriving dwarfhold of Ikstall to the twelve clans of Qnarr beneath the Thunderpeaks to the north, making these mountains the highest populated dwarven region of Tharstelding. River Endin: Birthed in the mighty peaks of the Heman Dal, the river Endin is the second longest river in Tharstelding measuring nearly a thousand total miles in distance with an average width of over a mile. The river contains over two hundred species of fish and is a major artery for trade throughout the southern half of the kingdom. Numerous small towns dot its banks sending goods into the Southern Reach and upstream deep into Murkhall. Like all good arteries however, the River Endin has its cholesterol. Pirates and smugglers currently control trade along the rural stretches of the river, causing the kingdom significant losses in tariff revenues. The current king of Castros, King Artis Telman, has recently charged the barons of Marjes with the duty of creating a large royal navy in the city of Janport to battle the pirates that currently stifle trade along the river. Western Cross: The Western Cross is a high elevation mountain pass and is the best known way to cross from Xar Zanth into Castros. The Western Cross remains at an elevation where snow melts during late spring allowing almost half a year of excellent travel with the heart of winter being its only impassable time. Pre modern Castros the site of the Western Cross was the lair of the last great Wyrm Tyrant, the great white dragon Vessix. The first king of Castros, not yet king at that time, Verzies Telman along with a host of clerics devoted to the god Radiance set out to rid the land of Vessix. Many clerics of the Battle Maiden were slain in the battle, and Verzies was terribly wounded. Leaving his men behind, the future king of Castros chased the dragon into its ice walled cave high in the peaks of the pass. And after a long and tiresome battle Verzies killed the great Wyrm Tyrant Vessix and cast its massive white head down the mountain side to the clerics below. As the years came to pass Verzies was crowned King Verzies Telman, first king of Castros. As a sign of gratitude to the clerics of Radiance, the king set aside a large tract of land to be used as a grave and monument to the brave warriors of the Western Cross. The Glaive Sea: Towering Blade Grass sweeps for miles in all directions in this area known as the Glaive Sea. Blade Grass appears much like dark green crab grass but can reach an amazing 10 feet in height, this bizarre plant gets its name from its razor sharp edges, which have been the undoing of many an unsuspecting traveler. It is rumored that an old and powerful druid lives within the Glaive Sea, and is the very reason for its massive Blade Grass. It’s also whispered in taprooms around Castros that beasts of massive size hide within the verge, and that a great and cunning Meadow Dragon lives within this realm, with her brood of a thousand wyrmlings. Brownback Hills: The River Endin winds through these soldierly hills which surround the port city of Janport in southern Castros. The Brownbacks are abundant with wild game, in addition giant eagles can sometimes be seen soaring high above the hills in search of larger prey. It is known that at least a dozen clans of Hill Dwarves and Hill Giants live within and around these hills, and it is thought that a large Hill Giant graveyard is hidden somewhere within the tracts of brown bumps. The Brownback Hills have become a popular hiding spot for bandits and mischievous monsters, as they flank a major north/south road leading from Janport to Fain. The Sunken Forest: Long before the kingdom of Castros the Sunken Forest was the heart of the mighty elven empire Vildarru. Nearly as large as the Greatland Forest then, now it is a vibrant swampland teeming with bizarre and alien life that lurks under the dead and half buried canopy of the long fossilized forest. The elven capital of Triskelmeen still remains, ruined and half consumed by the surrounding forest. The location of Triskelmeen is well known, only the strongest and most foolish dare search its submerged chambers for treasures from the lost elven people. The disaster that is now the Sunken Forest is rumored to be the result of elven high magic and a deadly conflict with a long deceased troll shaman of great power known as Grull the One Eyed. High Roof Forest: The High Roof Forest is a mountainous region of Northwest Castros. This temperate broadleaf forest is home to over two hundred species of trees and countless smaller plants. The area enjoys hot summers and cold winters with wet springs and falls. The High Roof forest contains a high level of awakened trees and animals, most likely due to the notorious circle of druids that call these woodlands home, the Thistle Knights. The Pale Fingers: The Pale Fingers constitute the major tributaries of the River Endin. Birthed in the mighty Heman Dal Mountains, this trio of swift moving rivers converges 100 miles inland directly in front of the city Murkhall. The Northern branch of this river system runs along the Western Cross, providing a steep canyon that links the Kingdom of Castros with its neighbor, Xar Zanth, in the west. These cold water rivers are home to dozens of species of fish, including dollies, salmon, brook trout, bowfin and quillbacks. The rivers are locally spoken of as haunted, ghostly shapes have been reported to swim against the current of these rivers on cold winter nights, and more than a few anglers have vanished while fishing along their shores. The Tablelands: The high and flat Tablelands rest at an elevation of about 3200 feet above sea level. This area contains few trees, but is riddled with hardy shrubs and small bushes. A harsh and unforgiving environment, these lands are ruled by tribal barbarian warlords and druidic shamans. 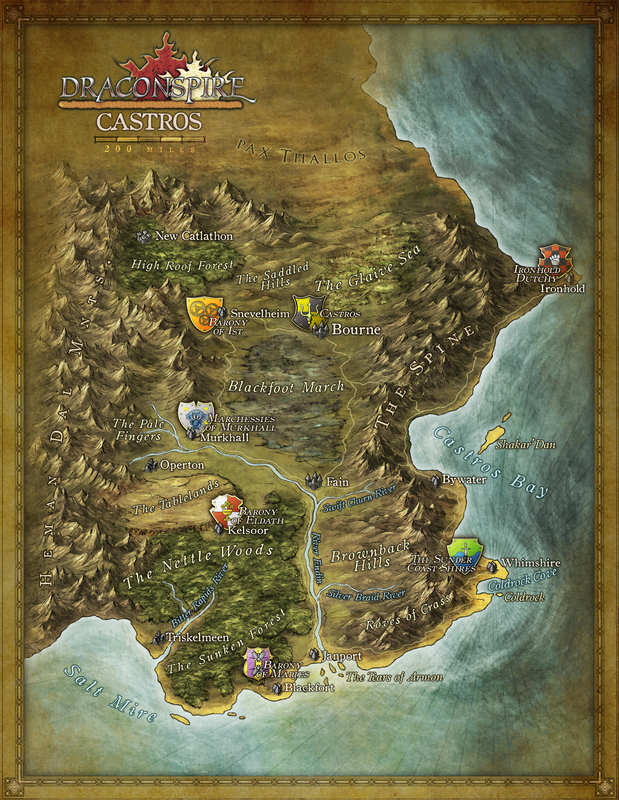 The region contains the highest density of plains elves in the kingdom of Castros, 3rd in the world only to High Dar to the north and The Tracts in Dayrmacia. High winds sweep south across the Tablelands, sometimes creating small whirlwinds or dust storms, these temperate grasslands are home to packs of worgs, aurochs, horse and pegasus. Hives of giant scorpions, ankhegs and ants are also not uncommon. Several tribes of centaurs and goblins inhabit this area, and the ruins of a long forgotten centaur kingdom can be seen occasionally throughout the landscape. The Nettlewoods: The Nettlewoods start to the north of the Bitter Rapids River and run east from the Heman Dal Mountains to the River Endin. These semi tropical woods benefit from the shelter of The Tablelands to the north and the mountains to the west. Warm air, low but constant rainfall and plenty of sunlight makes this region a year round paradise, with temperatures rarely below 60 degrees. The woods are home to countless species of flowers, fruits and herbs as well as hordes of forest gnolls, bats, dire animals, predator cats and large birds. Giant crystal stalagmites often called Pallar’s Bones rise from the forest floor in random locations, making the Nettlewoods a holy site for those that worship Draconspire’s creator. Bitter Rapids River: A warm and sluggish river, the Bitter Rapids moves through the Nettlewoods and the Sunken Forest for over 200 miles. Formed by rainfall throughout these two forests, the Bitter Rapids overflow is accountable for the marshy terrain of the Sunken Forest to the south. Home to crocodiles, aboleths, constrictor snakes and water nagas, this water way is generally held in cautious regard by the local residents. The ruins of Triskelmeen, an old and crumbling elven city, lay at the mouth of the Bitter Rapids, where the river empties into the Salt Mire Sea. Roves of Crass: Located in the Southeastern most corner of the kingdom, the Roves of Crass are a small range of volcanic mountains that are wedged between the larger Spine Mountains and the Briar Deep Ocean. This region is barren, humid and nearly devoid of all but the most savage of life. The mountains constantly spew forth ash, lava and plumes of noxious sulfur. Obsidian, sulfur deposits and semiprecious stones. Phoenix are known to inhabit these mountains, which sometimes draws the attention of expert hunters or glory seekers bent on the capture of such beautiful and renowned creatures. Fire elementals, fire giants and red dragons are also often spotted within this range. The Tears of Armon: The mostly uninhabited Tears of Armon lay at the mouth of the River Endin, where the massive river empties into the Southern Reach. These five small tear shaped islands are covered in briars, hardy coastal shrubs and stunted trees. The islands are constantly buffeted by winds from the South, breaking the hard salt wind of the Southern Reach from crashing into the city of Janport. The Tears of Armon are an estuary for many species of migrating birds when the seasons change from winter to spring twice a year. Twelve years ago, a royal prison was established on the largest of these islands directly in front of the mouth of the River Endin. Castros’ worst and most vile criminals are sent to Brinerock to serve life sentences, none that are sent to this fortress are ever seen again. The remaining islands are home to migrating birds in the spring and summer months, swarms of green and blue crabs, lizards, bugs and small mammals. The islands were once home to a powerful bronze dragon named Geltarvis who mysteriously disappeared over twenty years ago. It is said this great dragon had several vast hordes, one on each island, but as of today only two have been discovered, a point that draws many adventurers and archeologists to the Tears. Swift Churn River: Located directly south of Fain, this fast flowing river originates deep within the Spine Mountains to the west, glides nearly a hundred miles to the Southwest and empties into the River Endin. The Swift Churn is a fast, wild and dangerous mountain river with few known crossings, nearly eighty yards wide at its greatest point. The cold mountain waters are home to few fish, but house a large population of crawdad and other crustaceans. Nearby mountain caves house a healthy population of basilisks, which have been known to litter the river banks with statues of unlucky travelers. Silver Braid River: The lazy warm water of the Silver Braid River meanders from the Spine Mountains in the east through the Southern tracts of the Brownback Hills some hundred and fifty miles before finally dumping its wash into the River Endin. The river is over one hundred yards wide at its best but runs shallow enough to afford many crossing points. The area is respectively populated, with local farmers taking advantage of the river to provide irrigation and power for mills. The waterway earned its name from a large silver rush that first brought settlers to this area in 1853 CM. An ample supply of silver trout and flatbeak fish provide food for the local residents, giant eagles, bears, electric eels and the occasional water naga that call this river home. Cold Rock Cove and Cold Rock Island: This small cove located along the Sundercoast, directly south of Whimshire, is home to Cold Rock Island. The island houses a famous bardic college, the Villanesque. This school maintains a permanent teleportation circle to the city of Whimshire across the bay due to the dangers imposed by sailing in these treacherous waters. The cove itself is deep and churns constantly, seeded with yellow kelp and home to whales, seals, birds, octopus, and merfolk. An old fisherman tale speaks of a sea serpent that lives within the cove, and that the turbulent waters are a result of his never ending dance to the songs that can be heard from the Villanesque. Shakar’Dan: The mysterious island of Shakar’Dan is littered with ruins from an old and forgotten ogre kingdom. Large stone heads ring the island looking outward into the sea as if expecting their master’s return, old growth timber dots the low rising hills that still carry the crumbling marble columns of the long lost kingdom. The island is now infested with wyverns, griffons, chimeras and manticores. Formidable obstacles for would be treasure hunters and adventurers. The Saddled Hills: These low rise flat topped hills split the greener lands of the Glaive Sea to the East and the High Roof Forest to the West. Notably warm year round from the dry air that seeps south from Pax Thallos, these hills are teeming with vegetation and life. Natural springs create numerous watering holes in the hill’s many small valleys. Countless bugs call this region home, including giant centipedes, mantis, spiders and scorpions. Several goblin, hobgoblin, orc and gnoll tribes lay claim to these hills, feeding off the large population of bison and wild horse that are native to these lands. Lightning storms and flash floods are not uncommon throughout the Saddled Hills. Important Sites: Castros is home to some of the most impressive cities and ruins in all of Draconspire. The sites listed below are a small sample of such locations. Bywater: (Small City, 5,302): Bywater is a major exporter of Castran stone and coal. The city is governed by a dwarven Reeve, Skelvon Ten Rings (LN) who personally oversees the mining operations in his city. Skelvon's clan has long defended the eastern shores of Castros from creatures that dwell within the nearby Spine Mountains. Bywater is well known for its master dwarven blacksmiths, many students come to the small city each year to learn from these dwarven craftsmen. Bourne: (Metropolis, 30,560) Bourne is the capital of Castros. Many noble houses have residence within its high walls. The most notable of these is house Telman, which has been ruling the kingdom for the last six hundred years. Bourne is a major trade city with the kingdom of Pax Thallos, exports are shipped to the city from all over Castros to be traded via land with the northern theocracy. The people of Bourne are city folk to the core, most residents of the metropolis have never traveled farther than a score of miles from the walls. Not that they would have any need to, Bourne is safe, clean, and has just about anything anyone would need to buy. The current ruler of the city also has domain over the whole of Castros. King Artis Telman (LN) the 16th King of Castros is well liked by his populace. His son Prince Brandon Telman (LG) is an example of courage and vigor and a sign of the kingdoms bright future. Janport: (Large City, 19,175) Also called Jannisport by its residents, the city is named after a renowned Marjes knight, Ser Wilock Jannis. Janport rests at the end of the river Endin and is the busiest water port in the kingdom. 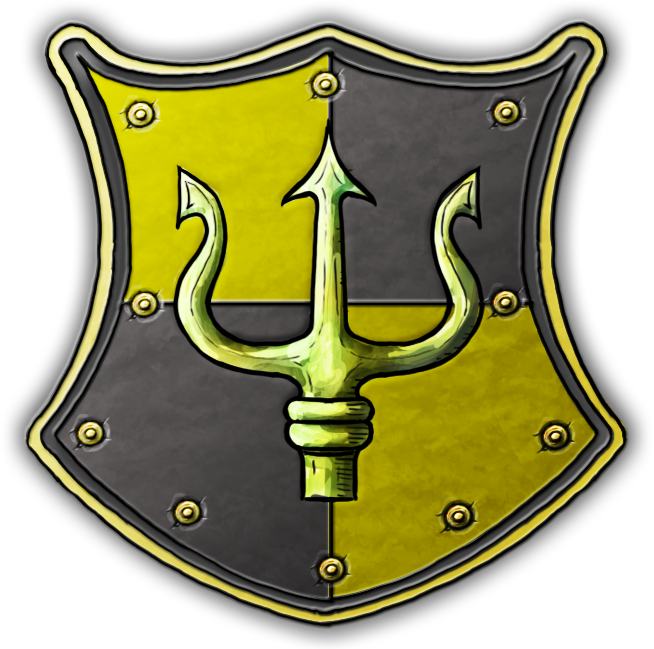 Janport is ruled by Lord Ruelk Jannis (LN) an elderly lord and banner man to the Marjes house with a little too much family pride. Janport has had problems with frequent pirate raids up and down the River Endin and has, by order of king Artis the 3rd, begun construction of a royal navy to patrol the river and sea routes under the supervision of the Barons of Marjes. Fain: (Metropolis, 27,560) The City of Heroes, twenty years ago Fain was the size Bywater. The metropolis can contribute its massive growth to the arrival of a band of powerful heroes throwing fistfuls of gold to the wind. Fain is the center of many organizations and a religious nexus. The Verdant Hand, or The Hand as most call them, began here under the leadership of Coop Dawnbringer. In addition the city boasts one of the largest druid groves within Tharstelding Fain is ruled by one of the heroes whom the city has grown under, Baron "Filthy" Ike, appointed to the title of Baron by king Artis in appreciation for the heroes selfless charity. Snevelheim: (Metropolis 32,155) One of the technological marvels of the ages, Snevelheim is commonly referred to as the City of Steam. The capital city of the Barony of Ist, Snevelheim is home to Baron Cyless Ist (LN) and Baroness Aerin Ist (NG). The city itself rests in a shallow valley at the foot of the High Roof Forest, steam powered gates grant access to the city interior. A set of rail tracks extend northwest nearly two hundred miles to the sky port city New Catlathon. Snevelheim is alien to the first time visitor, where steam powered automations travel the cobbled streets, lamps burn with caught lighting and the mundane act of walking is replaced by standing on elevated beltways. A large clock stands at the center of town, around which tinkers have set up shops to sell their bizarre automations and gunsmiths demonstrate the power of firearms. Murkhall: (Metropolis 28,823) The brown stone walls of Murkhall rise up from the low hills just East of the Pale Fingers, and West of the expansive Blackfoot March. Capital of the Marchessies of Murkhall, Marquis Calondor Telman (NG) rules his lands from a high perched castle near the center of town. The city is constantly under a haze of drizzle and fog, which encourages the growth of the cities namesake brown slime along any stone wall. The natural florescent fauna of this region likewise grows in the cracks of stone walls, on the sides of slick streets or in the shady alleys between the low rise buildings, giving the area a stark contrast of vivid color and drab backdrop. Kelsoor: (Metropolis 25,040) Barely a metropolis by development standards, the gilded city of Kelsoor blends the architecture of human and elven minds. Golden elven spires rise next to sturdy white marble human towers. The city of Kelsoor lacks a traditional stone wall, but benefits from a golden half globe of arcane energy that encases the city, preventing the entry of any creature with an evil alignment and protecting those within it with a constant feather fall effect. This ward is tended by a coven of elven witches that reside within the Vindris Spire near the heart of the city. Baron Fendar Eldath (NG) and Baroness Rose Eldath (NG), rule the Barony of Eldath from a silver clad manor built into the steep southern cliff of the Tablelands amid a wide variety of hanging gardens and flowers. Blackfort: (Metropolis 28,007) The Blackfort rises from the edge of the Sunken Forest along the coast of the Southern Reach. This gloomy city is the capital of the Barony of Marjes, ruled over by the Marjes brothers. Sorcerous twins of mysterious origins who many claim have devil blood within their veins. The walls of the Blackfort rise high against the ocean winds of the Southern Reach, sloping inward to let in light towards the Sunken Forest. The city gets its name from its black walls, produced from layers of tar spread over the sandstone bricks to prevent the harsh salt winds from eroding their mortar. The city houses many magical item and alchemical shops, along with the Forked Spire, a sky stretching temple of black iron dedicated to Calldarop, the god of lighting. Whimshire: (Small City 8,910) De facto capital of the Sunder Coast Shires, Whimshire is a small city with a big reputation. Its wildly painted wooden walls are home to some of the most prestigious bardic colleges in Tharstelding and some of the most famous composers of known history. The City of Laughter is ruled by Reeve Alkeys Silvermane, who serves the Duke of Ironhold and in turn the Telman dynasty. Whimshire rests along the north shore of Coldrock Cove. The cities most renowned college, the Villanesque, is located on Coldrock Island. Alkeys Silvermane runs the school and admittance is limited to less than 100 students per year. Ironhold: (Large City, 22,651) The lofty mountain citadel of Ironhold rests high in the Spine Mountains, above the frothing coast of the Castran Bay. The stewards of these lands, Duke and Duchess Jent, maintain a contingent of Mountain Elf druids to calm the dangerous path to the port when ships are passing in and out of the harbor. The cities jagged iron angles jut out of the mountain side, looming in the shadows of the Spine like some sleeping porcupine. Several iron braided suspension bridges run to platforms that in turn lower to the sheltered port below. The city is known for its spontaneous and violent winds that blow down the streets. These gales create eerie whistles and moans as they pass by the walls sharp angles, leading many to believe the city is haunted. New Catlathon: (Metropolis 27,080) New Catlathon is a major trading hub for the kingdom of Castros, mainly due to its bizarre sky ports. These elevated docks are raised and lowered by giant pistons and berth the regions many skyorbs and airships. A technological mecca, New Catlathon also rests at the end of a railway linking the city to Snevelheim, further increasing the logistics of trade for this region.